Free Curriculum Ideas for Your School. You are welcome to use these for your classroom, however, all items are protected with copywrite and cannot be reprinted or reproduced in any way for other's commercial benifit. Touch every student every day, give honest compliments. The difficult child is the one who needs your positive care the most. Self-concept determines a child’s success, or lack of success in all aspects of his/her life both now and in the future. Self-esteem is learned. It is developed through interaction with significant others in one’s life. 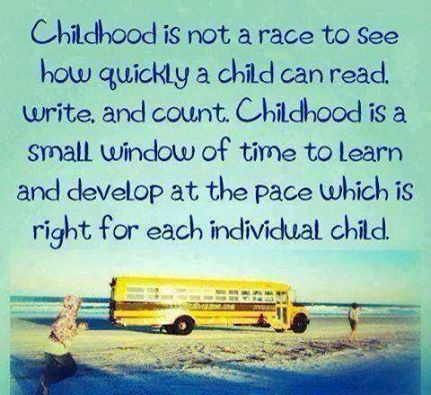 As teachers we are significant others in a child’s life. Adults often fail to consider that young children believe and remember what is said to them. They have limited experience, thus our reaction to them and to their efforts is what tells them whether or not they are valued and loved.Ways of building self-esteem in your students. Even young children seem to know if you are sincerely paying attention to them. **GIVE CHOICES WHENEVER POSSIBLE: Isn't our own self-concept enhanced when we are given a choice? This is an instant destroyer of self-esteem. **HELP THEM TO DEVELOP A POSITIVE ATTITUDE. A positive attitude is valuable in all situations, no matter how threatening. **ALL CHILDREN WANT AND NEED APPROVAL. **DRAW OUT THE SHY CHILD. 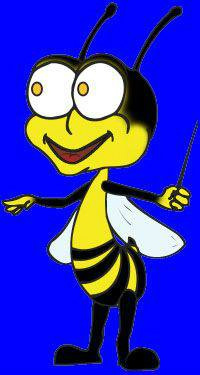 Never force, but help this child to make friends and become an important member of the group. **DON'T TAKE INAPPROPRIATE BEHAVIORS PERSONALLY. If you consider that children's curiosity is only mischief you are robbing them of the satisfaction of discovery. * Do I have too many rules: or are they too complicated? * Am I expecting too much for their age of development? * Have I discussed the rules with the students at the beginning of the year? * Have I made the rules clear? * When a rule is first broken do I give the student a second chance, while explaining the rule one more time? * Are there enough appropriate activities available to keep all my students interested and involved? Do you ever wonder how your students perceive you? 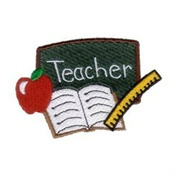 * Am I projecting an image that tells the children that I am here to enjoy teaching them? * By my behavior, do I serve as a good model for the students? 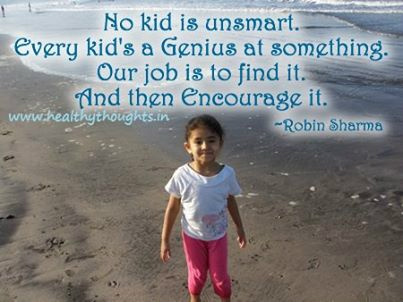 * Do I spread my attention around and include each child? * Do I watch for the child who may need extra attention? * Do I make special opportunities to praise EACH child at least once a day for their successes and their attempts? * Do I avoid having ‘favorites” and ‘victims’? * Do I have and do the students have a clear idea of what is and what is not acceptable? * Do I convey my expectations and confidence that the child can accomplish a task? * Do I encourage my students to try something new and to join in new activities? * Do I show students who return after being absent that they were missed? * Do I see disciplinary problems as understandable and not as a personal affront to me? * Do I look forward to going to work each day, and no matter what is going on in my life outside of the classroom, face the day with a smile and a positive outlook? Daily music activities should be an every day part of your day's curriculum. Not only do children enjoy and respond to musical sound, they also learn from its content. As with all other aspects of child development, the musical ability will vary greatly within the group. Keep in mind that children do not have the wide range of the musical scale that most adults do. 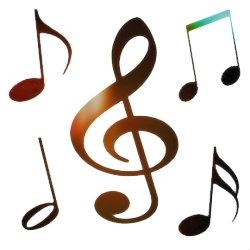 When it is suggested that a song be sung to a particular tune, such as 'Old McDonald', sing it in the key of C. It has also been found that children learn songs easier from the teacher's voice than if accompanied on the piano or some other instrument. Music can be used to set the scene in the classroom. Choose quiet, restful music during rest or nap time. Also Songs can alert students to activities during the day. When the teacher sings 'JOLLY PICK UP TIME', it reminds children that play time is over and the next activity is beginning. It works better than the teachers voice or a bell and makes the transition more fun. 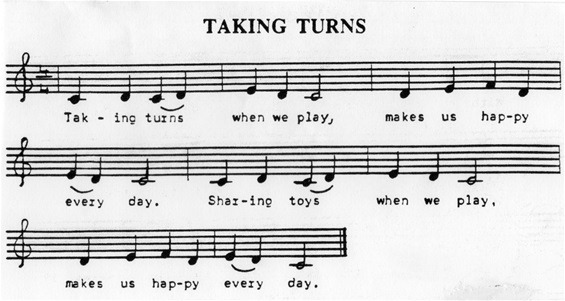 The song 'TAKING TURNS' helps students settle confilcts without giving blame or scolding. The words will remind them of the rules of taking turns. 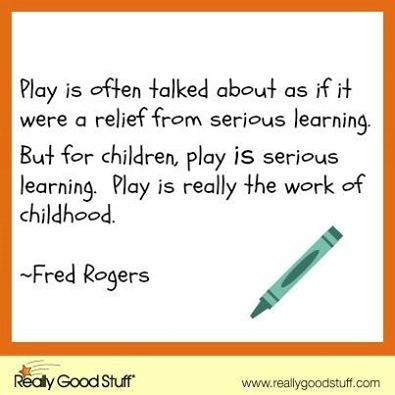 Or if it is a matter of sharing, you can change the words to 'sharing toys when we play, makes us happy every day." Taking turns when we play, Makes us happy every day. Or use these words to encourage sharing. Sharing toys as we play Makes us happy every day. 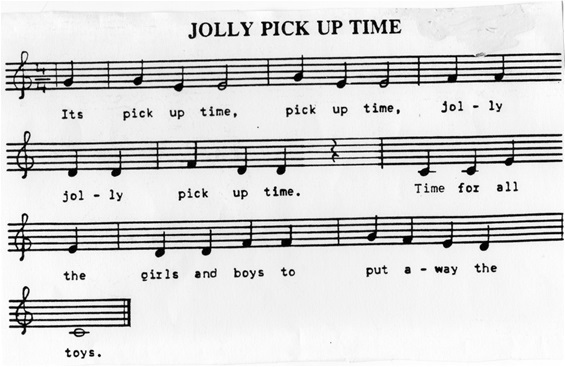 It's pick up time, pick up time, jolly, jolly pick up time. Time for all the girls and boys to put away the toys. Coloring pages help kids develop eye-hand coordination, color concepts and form the foundation for early learning success. 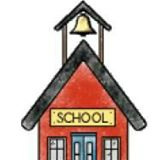 The majority of the monthly coloring pages featured in our curriculum are from Raisingourkids.com, who has graciously given us permission to use. Their printable kids coloring pages may be used only for personal, non-commercial use. Parents, teachers, churches and recognized nonprofit organizations may print or copy multiple kids coloring pages for use at home or in the classroom. In the beginning of the year we used the large crayons, (easier for little hands to hold and direct.) 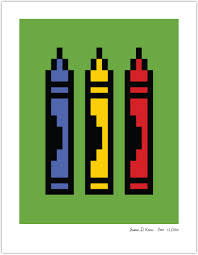 We also start out with the basic box with 8 crayons in red, yellow, blue, purple, green, orange, black and brown. Student science excercise: Let student fill two glasses half full of water. They squeeze one or two (equal) drops of various food coloring into the water. (If making green, use yellow in one glass and blue in the other glass. 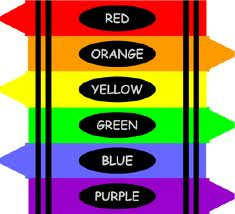 if making orange, use yellow in one glass and red in the second glass, if making purple, they use drops of blue, and red. (less blue than red here or the color will turn too dark.) Stir until the colored water is clearly mixed). Now have student pour the glasses into one large glass, mix well, and presto! They have magically made brown. 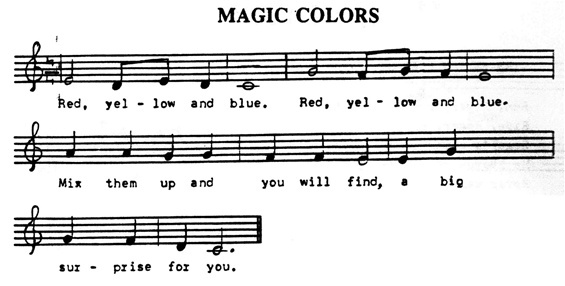 words: Verse 1: Red, yellow, and blue, Red, yellow, and blue. Mix them up and you will find a big surprise for you. Verse 2: Orange, purple, and green. Orange, purple, and green. Prettiest Colors brought here for you, Made from red, yellow. and blue. Let your students work on peeling off the paper wrappers from each piece of crayon. Next break any larger pieces up into smaller ones. Arrange the colors however you like in a small ovenproof muffin tray. (Use basic colors to make other colors. Melt red/blue together to make purple, yellow/blue to make green, yellow/red to make orange. Or use white added to basic colors to make pastel colors. Add all colors to together to make brown. 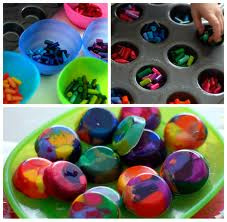 Place broken pieces into cupcake pan, putting different color mixture into each cupcake indention. Place on cookie sheet to bake. (Teacher does this. Children watch but well away from the hot melted crayons.) Preheat over to 250°. Bake until melted which is about 10 minutes but keep an eye on them as some may melt quicker. Very carefully, so as to not spill any melted crayon, remove cookie sheet from the oven. As the crayons cool, they will harden. To speed up the process, transfer molds into the freezer after the crayons firm up. After about 30 minutes, remove molds from the freezer. Once they are cool remove them from the molds by tapping them out. Add to your art table so your students can enjoy what they helped to make. 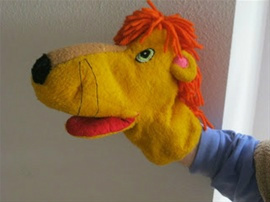 BE COMFORTABLE: Choose a puppet that fits your hand well and is easy to use. With a little practice the use of puppets will beocme natural and will be a fun part of th day's schedule. BE FAMILIAR WITH THE DIALOGUE SCRIPT: Practice at home if need be. Your students will focus on the puppet talking. 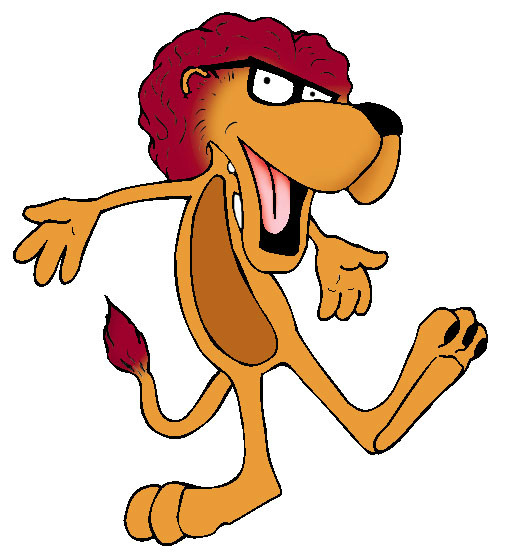 BE FLEXIBLE: if a student volunteers conversation relating to the topic at hand, pick up on it and add to the puppet's lines. This is a time for the children to express feelings and thoughts. However, keep the dialogue moving. Actual script time should be no more than ten minutes. BE HUMOROUS: Keep the atmosphere light even during a sad scene. Whenever appropriate, laugh with the puppets. Touch on important concepts and ideas but do not lecture or preach. The puppet dialogues are written to entertain the students even as they are learning. Come out today, come out today. Lindy, Lindy, won't you come out and play. We have inserted dialogue scripts in some of our monthly activities pages. These puppet scripts may be copied and used freely but are under copyright and cannot be printed for publication.